/atri·al/ (a´tre-al) pertaining to an atrium. 1. Of or relating to an architectural atrium. 2. Of or relating to an anatomical atrium. adjective Relating to an atrium, usually understood as the atrium of the heart. adjective Relating to an atrium, see there, usually understood to be the atrium of the heart. Having to do with the upper chambers of the heart. 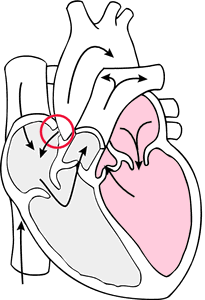 contraction of the atrial muscle; plays a part in ventricular filling and opening and closing of the A-V valves. return of blood via the venae cavae and the pulmonary veins to the atria. Too slow a return means inadequate cardiac output, too slow emptying means an increase in central venous pressure and possibly the development of congestive heart failure. The rate varies normally with the cardiac cycle, being fastest during atrial diastole and slowest during atrial systole. a peptide hormone found in cardiocytes of the right and left atria and released in response to increases in plasma volume. Plays a role in the regulation of blood pressure and volume, and in the excretion of water, sodium and potassium. Closely related or possibly identical substances include auriculin, atriopeptin, cardionatrin. most often is a complication of endocardiosis and valvular insufficiency in dogs. The resulting acute pericardial hemorrhage may cause death from cardiac tamponade. a congenital heart defect in which there is persistent patency of the atrial septum, owing to failure of closure of the ostium primum or ostium secundum. complete lack of atrial contraction; ventricular function remains normal. Caused by hyperkalemia, extreme sinus bradycardia, digitalis toxicity and a congenital muscle disorder of dogs and cats. The mechanism of new-onset AF involves stretch of atrial myocytes as a result of chronically increased left atrial filling pressures. Seward argued that reducing left atrial filling pressures through inhibition of the renin-angiotensin-aldosterone system via ACE inhibitor and angiotensin receptor blocker therapy appears to inhibit the deleterious remodeling process.